Do you remember Man With The Axeman? Dropscience? How about The Wookiees? 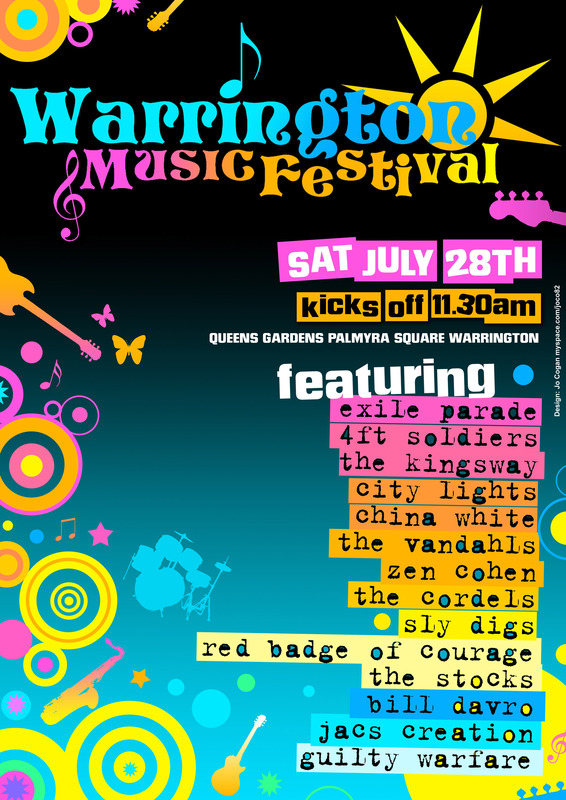 Since the first Warrington Music Festival back in 2007, the event has constantly evolved in format, moved to different months and reached out across the town centre. From Queens Gardens to Golden Square and everywhere in between, the organisers have put together events that bring the very best of local music together. 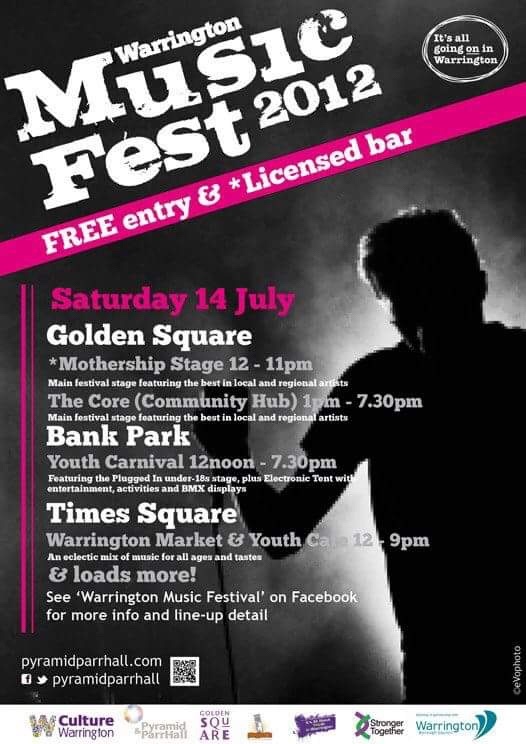 We’ve managed to put together for the first time, every year’s Poster for the Warrington Music Festival. Which was your first? Were Happy Mondays your highlight or did you play yourself and found it to be a highlight in your musical career, let us know on our Facebook page here. 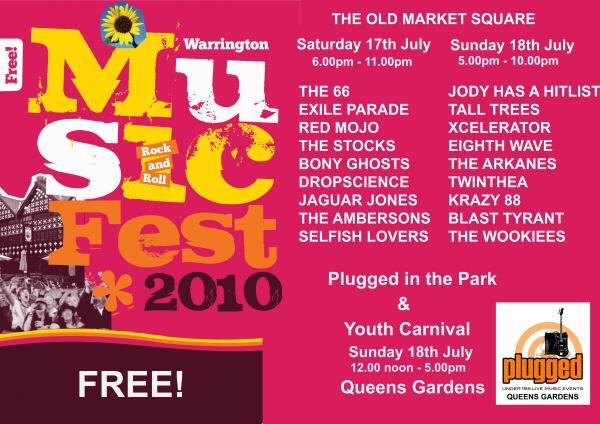 Warrington Music Festival 2007, launched as part of Culturefest 2007. Interesting fact: There was two stages, the 2nd which was under a wedding gazebo which was at risk of blowing away. What a long way the festival has come! Read about the first Festival here. 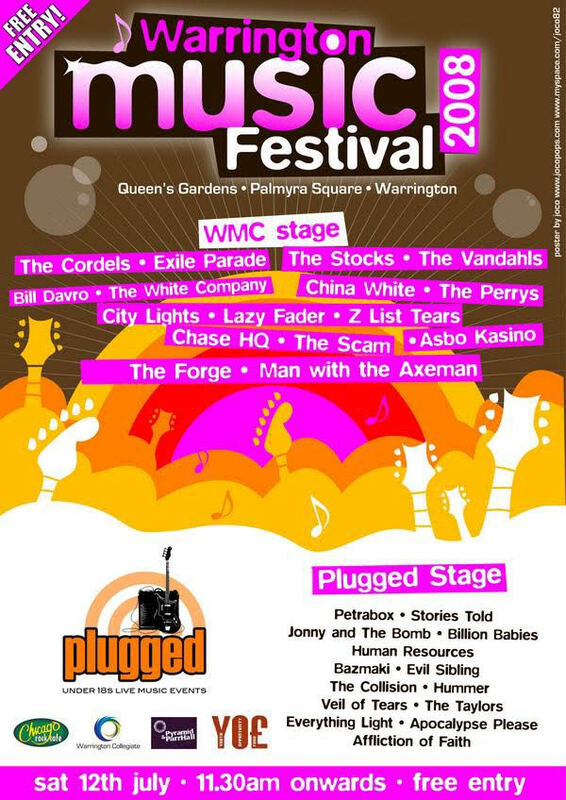 Interesting fact: The first to feature a stage for Youth Music Event ‘Plugged’ the event was also filmed by volunteers including your very own [WAM] Editor! Interesting fact: Many of these posters were created by the same person, Jo MacMichael of Joco Designs, who also created posters for ‘What A Waster’ nights at WA1. If you remember them, you deserve a high five. Find out more about Joco Design on her Facebook page here. 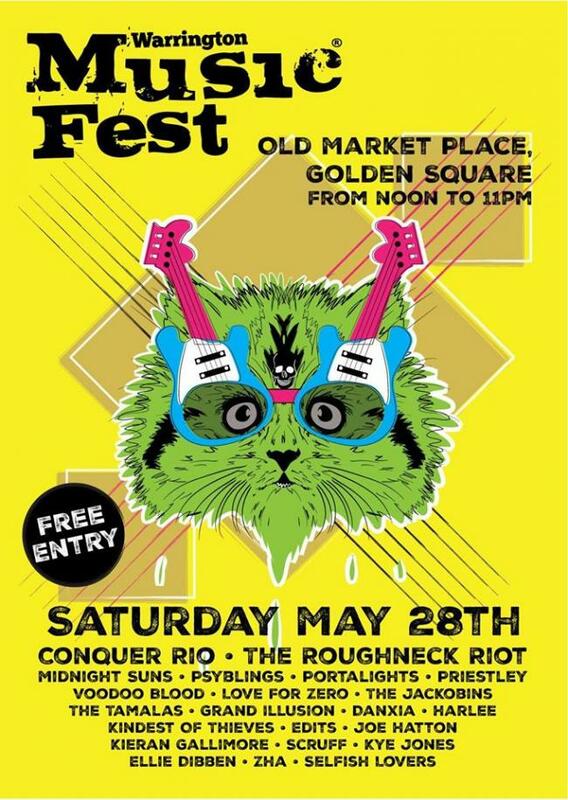 Interesting fact: The first Festival spread over two days saw Irish Pop Punk band, Jody Has A Hitlist headline the 2nd day at The Old Fish Market Stage. 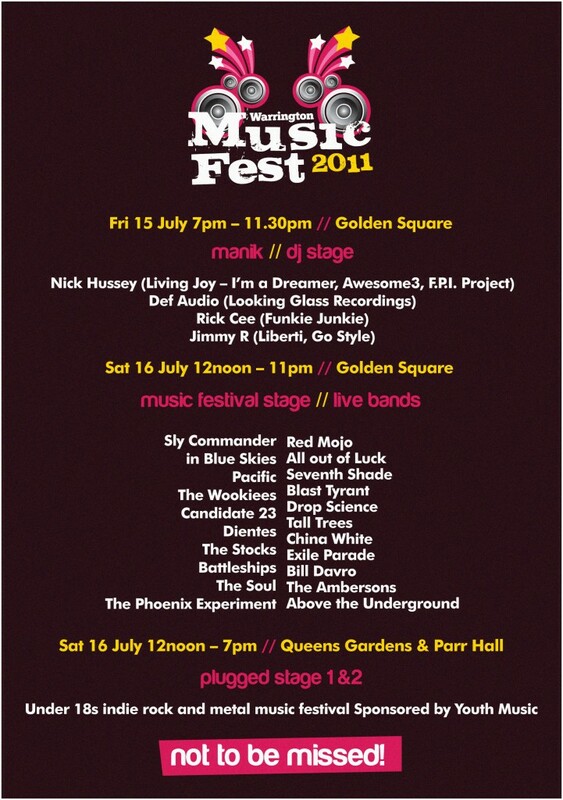 One of the guitarist has gone on to feature in a band playing Neighbourhood Weekender this month.. 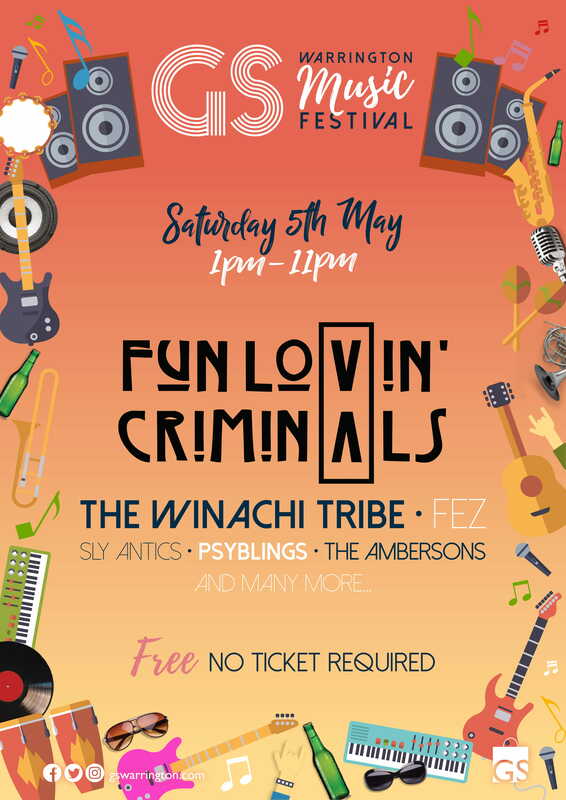 Interesting fact: Always looking to do something different, this years event had DJ’s performing on the Friday night, alongside the various guitar based bands. Interesting fact: It’s the only event I wasn’t there! 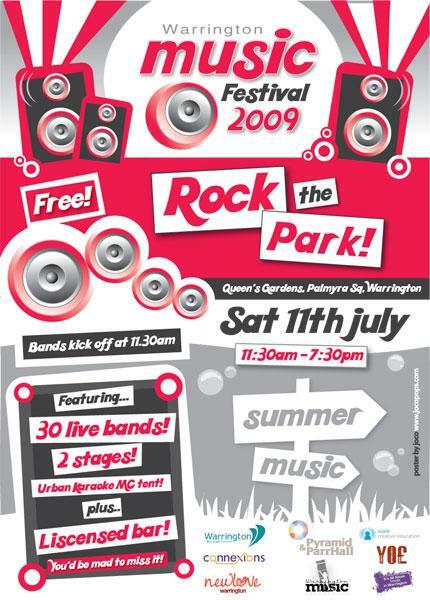 The band I was managing had played on the Bank Park Stage before continuing tour in Liverpool. Also the last performance by Dropscience, save for a one one show a year later. Friday 19th – Sunday 21st July, Queen’s Gardens & Barley Mow! Interesting fact: This was a big one! 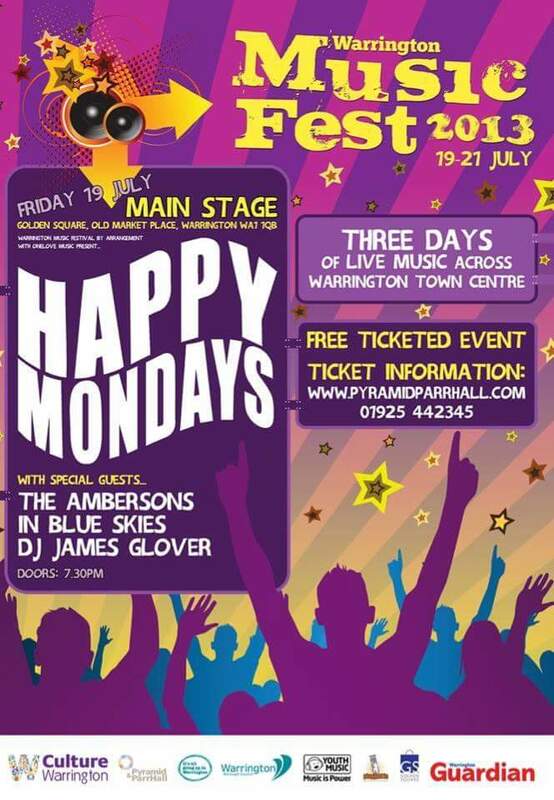 Tickets for Happy Mondays on the Friday were free, distributed on a first come first served basis, with 3000 in attendance. 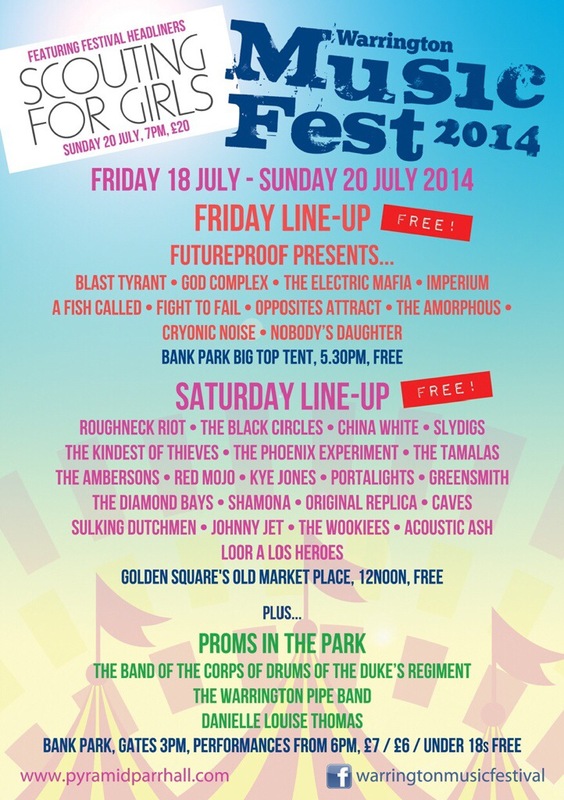 Friday 16th – Sunday 20th July, Golden Square & Bank Park. Interesting fact: The first and only event to feature a Big Top Stage, a long time wish of organiser and co-founder, Steve Oates. Scouting For Girls performed in Kent earlier in the day, and were sent up the M6 with a van full of Beer. Interesting fact: After a fallow year, the Festival was saved with the events long term future secured by the Golden Square, a move which also saw the Festival move to it’s new home in the month of May. Conquer Rio who previously supported Scouting For Girls headlined. Interesting fact: Slydigs brought the British Sign Language Choir onto the stage for their final song. 90’s Icons Cast & Space played a free ticketed show on the Sunday, which followed a huge ‘Don’t Look Back in Anger’ singalong, a response to the terror atrocity at Manchester Arena that risked the Festival being cancelled. Interesting fact: First time the local artist showcase has combined lineups with the special guest. This isn’t the first time an american band has played at the festival however. That goes to Darling Waste almost 9 years ago. It is however the first appearance by The Ambersons, as a full band since 2013! 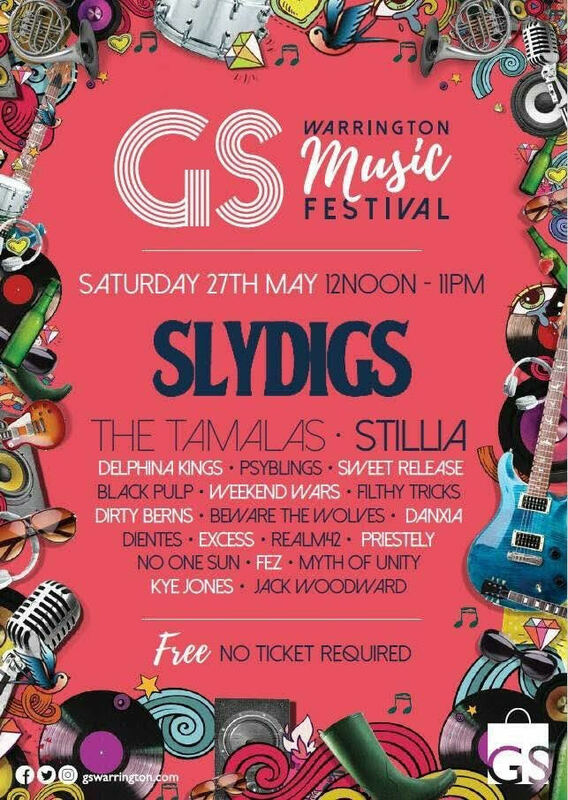 The 2018 Warrington Music Festival is a free ticket-less event, with music on between 1-11pm.